COLETTE, film directed by Wash Westmoreland! 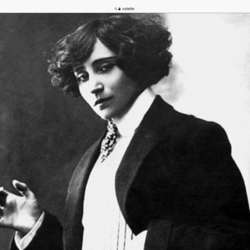 Colette (French: Sidonie-Gabrielle Colette, 28 January Protected content 3 August Protected content a French author and woman of letters nominated for the Nobel Prize in Literature in Protected content also known as a mime, actress, and journalist. Colette was most widely known for her Protected content Gigi Protected content , which subsequently was the basis for the film and the Lerner and Loewe stage production of the same name. Colette is a Protected content drama film directed by Wash Westmoreland, from a screenplay by Westmoreland and Richard Glatzer, based upon the life of the French novelist Colette. It stars Keira Knightley, Dominic West, Eleanor Tomlinson, and Denise Gough. Let us see this movie about this exceptional artiste together and then enjoy a cop of coffee afterwards!